Mars Express was launched on June 2, 2003 from Baikonur Cosmodrome (Kazakhstan) on a Soyuz-Fregat rocket to search for water and the possibility of Martian life. Consisting of a low-cost orbiter and lander, Mars Express is a European Space Agency (ESA) mission to the Red Planet involving a consortium of countries (primarily France, Germany, Great Britain, Ireland, Italy, Japan, the Netherlands, Norway, Russia, Sweden, Spain, and the United States). In February 2007, Mars Express was granted a second mission extension until May 2009. 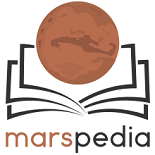 Official ESA Mars Express mission logo. Mars Express was a two-component mission consisting of the Mars Express Orbiter and Beagle 2 lander. Unfortunately, the Beagle 2 lander failed on entry into the Martian atmosphere and was lost on Christmas Day, 2003. The crash site of Beagle 2 was later imaged by NASA's Mars Global Surveyor in a crater near the planned landing site of the equatorial region known as Isidis Planitia. 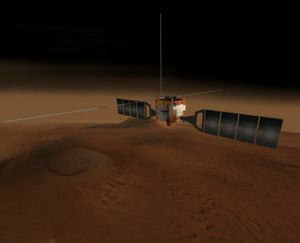 Despite this early loss, the Mars Express orbiter continues on its mission to explore the Martian surface. Mars Express will be providing support for the NASA Phoenix lander when it arrives on Mars in mid-2008. The High Resolution Stereo Camera (HRSC) for high resolution surface imaging. Energetic Neutron Atoms Analyser (ASPERA) to analyse how the solar wind erodes the Martian atmosphere. 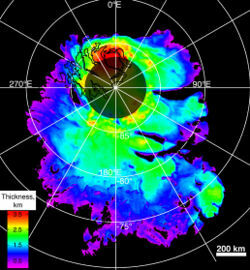 Planetary Fourier Spectrometer (PFS) to study of the atmospheric composition and circulation. Visible and Infrared Mineralogical Mapping Spectrometer (OMEGA) to determine the surface composition and evolution processes. Sub-Surface Sounding Radar Altimeter (MARSIS) intended for the search for water in the subsurface. The Radio Science Experiment (MaRS) for sounding of the internal structure, atmosphere and environment. Ultraviolet and Infrared Mars Atmospheric Spectrometer (SPICAM) for the determination of the composition of the atmosphere of Mars. Beagle 2 lander intended for geochemistry and exobiology. It has also carried out a wide variety of other important observations which have increased understanding of the Martian atmosphere and geology. This page was last edited on 17 December 2018, at 17:23.